For years, I have been eager to sample the highly-touted Steamboat Springs ski resort in Colorado. Famed for what they call “champagne powder,” the mountain promises to deliver excellent ski conditions. My ski buddy is to fly in from where he lives in Florida. We agree to meet at the Enterprise Rental Car desk at the airport, where we will pick up a reserved car to drive to the resort. After an hour of waiting at the airport desk (and not being able to call him, as he stubbornly refuses to own a cell phone), he calls me from where HE has been waiting for the past hour – the Enterprise desk at their remote office away from the main airport terminal. Soon, we are driving west towards Denver and the many ski resorts awaiting just west of that city. We arrive at the Steamboat Springs rental gear shop just before they close at 8 pm on a Sunday night. Fitted for gear, we check in at our low-cost Comfort Inn hotel. Our first day is Monday morning. It turns out to be, as Mark Twain would say, “the worst of times. And the best of times.” Skiing that first morning is awful, as the mountain is shrouded in a heavy, windy, icy fog all morning. Along with the fog is a heavy snowfall. Visibility is about eight feet. Due to the poor visibility, the moguls are hidden from view, which makes higher speed skiing rather treacherous. While this morning is one of the worst skiing experiences of my life, the afternoon turns out to be one of the best. The clearing skis bring out a gloriously bright sun. After a morning of not being able to see where I am going, this dramatically improved visibility brings me recklessly high levels of confidence. I’m flying down the slopes now at blinding speeds. Soaring with a big smile on my face. Things couldn’t be better. Quickly, we learn which runs are our favorites. We most enjoy See Ya, See Me, Rainbow, and Vagabond. Despite the heavy snow on this first day, Steamboat suffers so far this season from an unusually below average snowfall. While most runs show good coverage, we do see occasional grass and rocks exposed on runs due to the thinness of the snow. Our second day greets us with a full day of perfect ski weather. We take full advantage of it. Perhaps too much, as I suffer from a serious case of “toe bang” on both big toes. So painful that I can barely walk. Regretfully, we decide to abort our ski trip two days early. I vow to find a way to avert the injury in the future. Presumably by purchasing well-fitted boots. I’m too young to retire from skiing! Overall, we find that the signage at Steamboat leaves something to be desired. Mediocre directionals in the sense that often, intersections fail to have a sign indicating which way to go to get to a run or a lift. Another problem we find: The astonishingly high price for lift tickets -- $95 per day, with unusually limited numbers of ways to find discounts. We also learn that on top of the high cost, the resort allows the wealthy to pay $60 more each day in order to experience “first trax.” So unlike nearly all other resorts, where an early start allows one to ski virgin runs, Steamboat requires one to pay over $150 for such an experience. 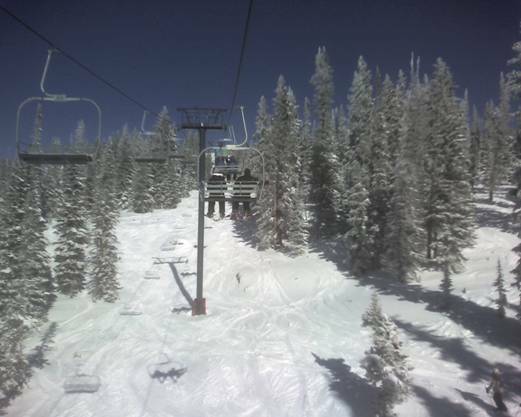 Nevertheless, Steamboat provides exceptional, numerous “glade” runs. We find ourselves joyously sking soft powder through what appears to be a nearly infinite number of wooded runs in the Morningside Back Bowl at Steamboat. 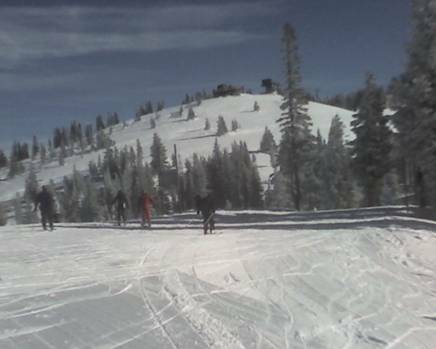 Overall, I would rate Steamboat an “8” out of “10.” A very nice place to ski.